• All lines are protected. Units provide surge protection on all three modes (L-N, L-G, and N-G). Units also have thermal protection on all three lines. • 600V UL1449 Voltage Protection Rating (VPR). Outstanding protection against harmful surges. • EMI /RFI noise reduction. Protects against data disruption due to electromagnetic or radio frequency interference. • Low profile. 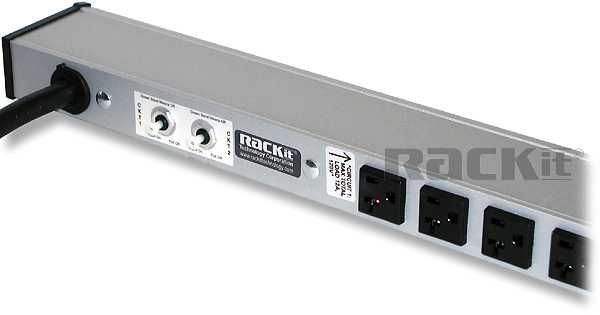 Units offer a narrow 1 1/2" x 1 3/16" aluminum housing featuring a gray finish and a black cord. • Standard 6" center-to-center spacing between receptacles. • Cord properly rated to load requirements. 15A units have a 14/3 SJT cord and a NEMA 5-15P plug. 20A units have a 12/3 SJT cord and a NEMA 5-20P or NEMA L5-20P plug. • Protection indication. All units have a protection indication light to show the status of the unit. • Resettable circuit breaker. Provides overload protection. • UL and cUL Listed or Recognized (UL1363 and UL1449, Third Edition). • 30 Amp Power Distribution. High amperage 120V units allow you to safely support power-thirsty IT equipment. • Dual circuit design. Two easy access circuit breakers provide overload protection. • Built in universal slide mounting rail. T-slot mounting rail allows several mounting options in tight spaces. • Aesthetic narrow aluminum profile. Streamlined housing saves valuable space featuring a gray finish and a black cord. • Printed Circuit Board (PCB) Connection of UL489 Breakers. Creates highly reliable connections to reduce potential point of failure. • UL Listed. Meet UL60950-1 1st Edition and ITE standards.